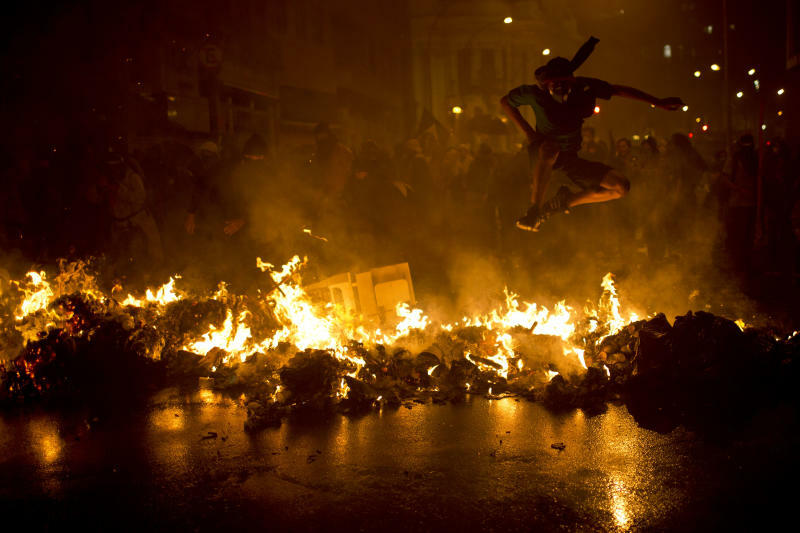 RIO DE JANEIRO (AP) — When a tear gas canister rattled around at Andrea Coelho's feet, a masked young man picked it up and tossed it back at police. Right there, the kindergarten teacher decided she backed him and his fellow Black Bloc anarchists. Coelho was one of thousands of teachers marching through central Rio de Janeiro to demand better wages and school conditions when police decided to disperse the demonstration. A few nights before, striking teachers occupying the city council building were beaten and dragged out by officers. 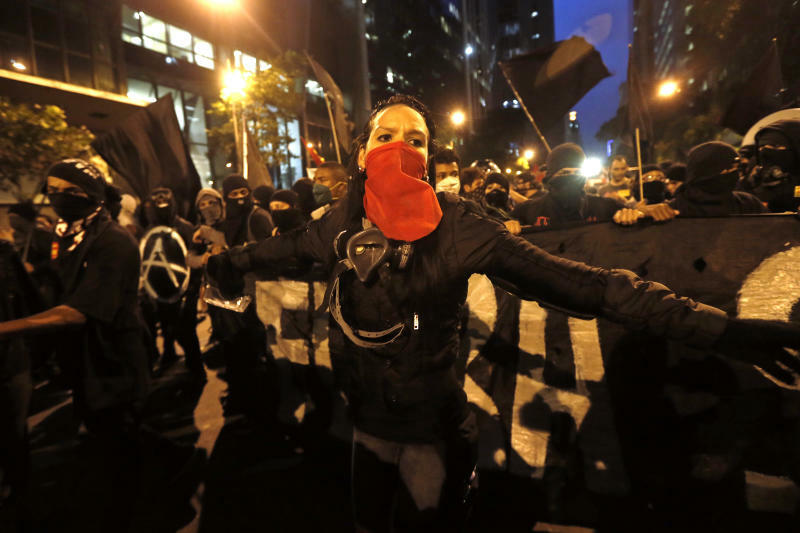 "It was the Black Bloc that protected me in that protest," Coelho, 47, said at the beginning of a march last week that again descended into fighting between anarchists and police. "The police came in firing tear gas, hitting us with clubs. A young Black Bloc stepped right in between me and the police. If it weren't for them, the police would have destroyed us." That sentiment has helped turn the anarchists in Brazil into a driving force behind protests in recent weeks. The demonstrations have lessened in size but not frequency since masses took to the streets in June, fed up with a litany of problems that mostly center on corruption, woeful public services, and big spending on the upcoming World Cup and 2016 Olympics. More protests erupted Monday as demonstrators railed against a government auction of a big offshore oil field, which petroleum unions think should remain completely in Brazilian hands, and the anarchists rallied in Rio's historic center to support the strike of the teachers and oil workers. Black Bloc is a violent form of protest and vandalism that emerged in the 1980s in West Germany and helped shut down the 1999 World Trade Summit in Seattle. 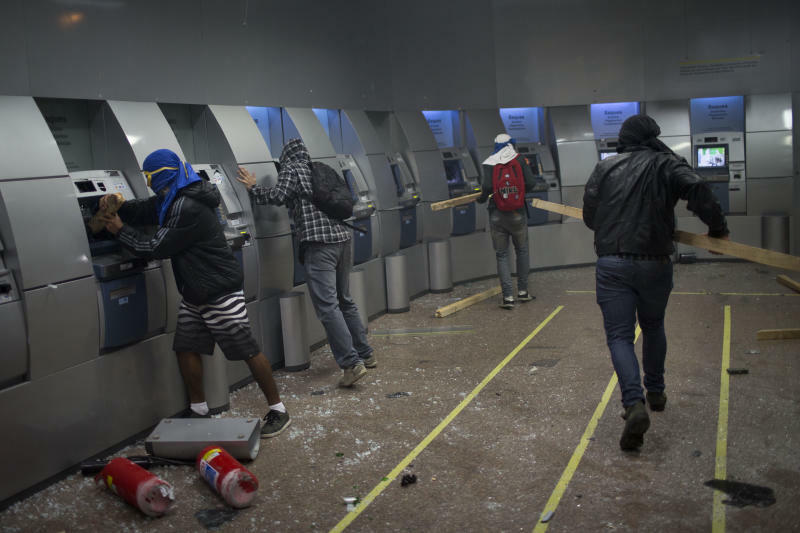 It's clear that the masked, young Brazilians are following the main anti-capitalist tenets of earlier versions, smashing scores of banks and multinational businesses during demonstrations and directly confronting riot police. The twist in Brazil, experts say, is that the tactics haven't been quickly rejected by more mainstream protesters as they have been in places like Mexico, Chile and Venezuela. That could allow the movement to grow significantly. During a protest in Rio last week, one young anarchist sprinted through a haze of tear gas as his throat burned and ears rang from a series of stun grenades police unleashed moments before. Taking cover behind a battered metal newsstand in Rio's historic Cinelandia district, the 25-year-old dread-locked man steadied himself, tightened the straps of goggles he was wearing, and yelled to a cluster of 30 black-clad demonstrators facing a line of riot police half a block away. "Fight! Fight! Fight!" he screamed amid one of Brazil's most violent protests since June. "It's all going down right now!" The protesters hurled rocks at police. The officers responded with more stun grenades and tear gas, scattering the adherents of Black Bloc. "People are fed up, and because of the police violence against peaceful protests, the Black Bloc returning that violence has become a way for people to express their indignation," the young man said at the end of the protest. Like seven other Black Bloc adherents interviewed, he wouldn't give his name, citing fears of arrest and the tactic's hallmark anonymity. "I don't expect a majority of people to support it, but I know they understand the anger." Black Bloc jumped via social media from the developed world to places such as Egypt and Brazil, where experts say it's potentially more explosive because it feeds off deeper social unrest. It's almost certain to affect Brazil's World Cup and Olympics. "The police, violence, poverty, hardship of life and economic inequality in Brazil can radicalize the situation to a greater degree," said Saul Newman, a professor at Goldsmiths College in London whose research has focused on anarchism. "It's hard to predict, but because of these conditions and because it's new in Brazil, it could grow." In the interviews with Black Bloc adherents, all repeated what's been heard in the U.S. and Europe before: They have no leaders, they operate in anonymity; there are no lists of demands for the government to meet. Wearing black and covering their faces to make it hard for police to identify them, they head to demonstrations armed with slingshots, Molotov cocktails and homemade wooden shields with "BB" printed in white. Many look to be in their mid-to-late teens. Their aim is to use action like destroying the property of multinational companies and confronting riot police to disrupt a political system they say doesn't allow for their participation and only represents entrenched economic interests. But as in Egypt and elsewhere, the Black Bloc in Brazil says it also exists to protect other protesters from heavy-handed police tactics. Brazilians widely consider their police poorly trained and violent, a force that is infamous for extrajudicial killings. A 2008 United Nations report said Brazilian police were responsible for a significant portion of the country's 48,000 homicides the year before. There have been no reliable public opinion polls on the Black Bloc in Brazil and it's difficult to gauge wider perceptions about it. Politicians and local media condemn the vandalism its adherents carry out, smashing up scores of banks and other businesses in major cities. Yet the tactic is clearly growing in cities like Rio. Six weeks ago, perhaps 50 people clearly identifying with the Black Bloc appeared in protests. At the Oct. 15 march by teachers, about 400 black-clad demonstrators were in the streets. Facebook pages dedicated to the tactic are increasingly rallying adherents. "The Black Bloc is important for me. It's shown me I can resist in alternative ways," said Gustavo, a 17-year-old anarchist at last week's protest who said he lived in a violent slum in western Rio. "I can't accept that I will live my entire life in a country that's so unjust. Until now, I've seen no other way to make real change and wake people up."